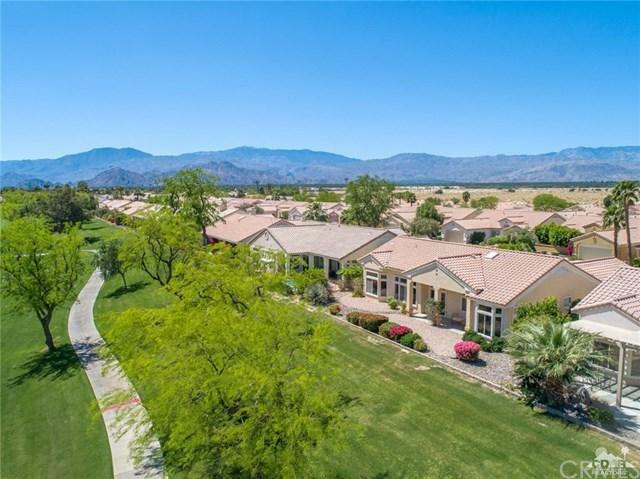 Sun City Palm Desert- Emerald. 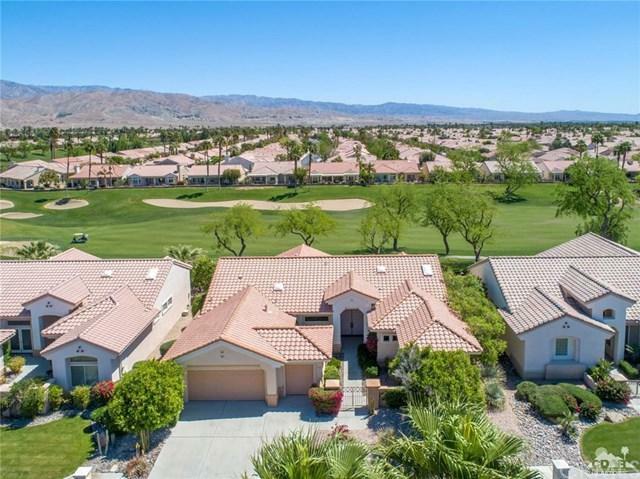 This estate model home sits high above the 13th fairway providing panoramic golf course & mountain views. 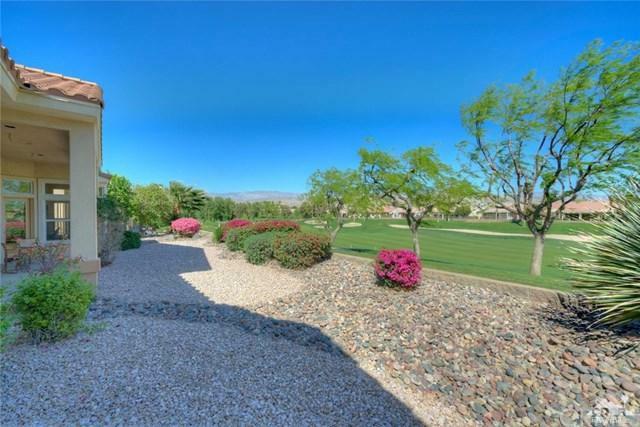 The east facing rear yard has a spacious patio surrounded by low maintenance desert landscaping. A gated courtyard & double door entry provide curb appeal. Inside, 12ft coffered ceilings are in the great room and foyer (w/uplighting). The kitchen has corian counters, a skylight & chef's island w/breakfast bar & vegetable sink. The master suite has a large walkin closet & a bay window. The master bath has a skylight, duals sinks, a stall shower & oversized spa tub. The extended guest suite has French doors to the courtyard & a tub/shower in its bath. The other guest suite has a stall shower in its bathroom. The laundry room has a utility sink & built storage. The 2+ golf cart garage has builtin storage & work bench. 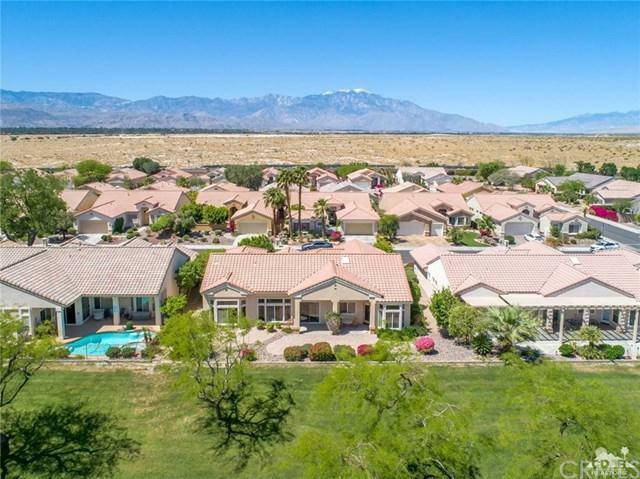 Based on information from California Regional Multiple Listing Service, Inc. as of 2019-04-20T21:32:17.19. This information is for your personal, non-commercial use and may not be used for any purpose other than to identify prospective properties you may be interested in purchasing. Display of MLS data is deemed reliable but is not guaranteed accurate by the MLS. Licensed in the State of California, USA. Based on information from California Regional Multiple Listing Service, Inc. as of 2019-04-20T21:32:17.19. This information is for your personal, non-commercial use and may not be used for any purpose other than to identify prospective properties you may be interested in purchasing. Display of MLS data is deemed reliable but is not guaranteed accurate by the MLS. Licensed in the State of California, USA.This information is deemed reliable but not guaranteed. You should rely on this information only to decide whether or not to further investigate a particular property. BEFORE MAKING ANY OTHER DECISION, YOU SHOULD PERSONALLY INVESTIGATE THE FACTS (e.g. square footage and lot size) with the assistance of an appropriate professional. You may use this information only to identify properties you may be interested in investigating further. All uses except for personal, non-commercial use in accordance with the foregoing purpose are prohibited. Redistribution or copying of this information, any photographs or video tours is strictly prohibited. This information is derived from the Internet Data Exchange (IDX) service provided by San Diego MLS. Displayed property listings may be held by a brokerage firm other than the broker and/or agent responsible for this display. The information and any photographs and video tours and the compilation from which they are derived is protected by copyright. Compilation © 2019 San Diego MLS, Inc. Licensed in the state of California.